Welcome to explore the Finnish agricultural landscape! 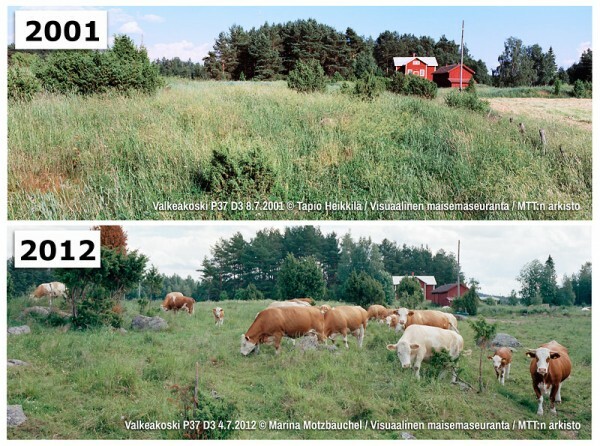 An example of changes in rural landscapes in the 21st century. This web site “Muuttuva maalaismaisema” (Changing countryside) introduces you to a variety of Finnish agricultural landscapes with the help of informative photographs. These photos not only depict typical Finnish farmland, but also demonstrate the changes that have happened in the Finnish countryside during the 21st century. Landscape changes typically occur gradually over a long period of time. Therefore they often go unnoticed. The purpose of this web site is to make these changes visible and thus offer tools for public discussion on the state and future of Finnish rural areas. What kind of landscapes do you appreciate? How do you feel about the changes in the Finnish countryside? Photographs presents agricultural landscapes from different parts of Finland. The images are arranged pairwise in chronological order, so that the same landscape is shown in two photos taken 5-15 years apart. The photographs illustrate both typical Finnish agricultural landscapes and traditional rural biotopes. Background provides more detailed information on how, where and when the photographs were taken. Classroom contains exercise materials and tasks for school students and everyone interested in agricultural landscapes and their changes. Links offers further information on the topics discussed on this web site.